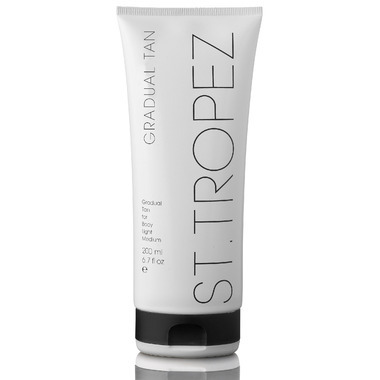 St. Tropez Gradual Tan Body Moisturizer is an enriched, nourishing body moisturizer that cleverly combines skin care benefits with a healthy touch of bronze. This gradual self-tanner will build up a gorgeous, golden glow over time. Simply massage into your body for a gradual tan. Suitable for daily use. What sets St. Tropez Gradual Tan Body apart? Infused with soothing aloe vera, this lotion will help give you smoother, skin while building a gradual golden tan, every day. St. Tropez's innovative Aromaguard™ fragrance technology eliminates the tell-tale self tan aroma by a minimum of 70% and instead gives a beautiful subtle, yet refreshing fragrance. Used to achieve the "no tan, tan"
Directions: Exfoliate before massaging this luxurious lotion in from toe to top. Don’t worry if you go over the same area twice, it’s only missed areas that’ll look uneven. Wait for the lotion to be absorbed before getting dressed and remember to wash the palms of your hands and in between your fingers after use. Use daily for a subtle golden boost to winter or sun tanned skin.